ConnectedText is an excellent personal wiki program, one which runs solely on the desktop. While this removes one of the features which many associate with wikis, namely, collaborative editing, it also makes ConnectedText much easier to set up and use for a single user. ConnectedText 5 continues to build on the strengths of prior releases without introducing useless bells and whistles or radically changing the interface or functionality. This overly-busy layout shows off ConnectedText's many features, but your actual work environment is usually much cleaner. Working in ConnectedText is straightforward. Create a project, and begin creating topics. Any word, term, or phrase you think might merit its own topic is marked with brackets, and you can then create that topic by clicking on the word (or create a topic directly from a menu--links aren't required). In a very short span of time, you will have many topics, all linked to each other. ConnectedText uses two modes, the editing mode and the view mode. In the editing mode, you type in plain text and mark-up words or sections using simple tags to denote headers, bold or italic, numbered lists, and so on. Flipping to view mode shows you a rendering of your text, automatically saving your changes (and like any wiki, you can revert to an earlier edit with ease). The actual formatting is handled by cascading style sheets, so if you know CSS, you can edit them to change the default fonts, colors, and so on. You can also enter CSS tags while you edit, to change the appearance of a section of text individually. What makes ConnectedText useful, though, is not being able to just type data, but to organize it and find it. ConnectedText imposes no default organizational model, but hands you a pile of tools you can use. Any topic can be placed into multiple categories. 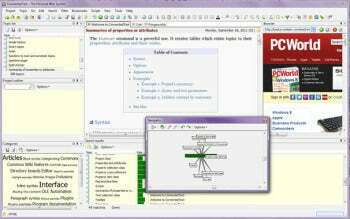 Outlines can be created to organize topics in a particular structure, and you can have multiple outlines per project. You can include topics, or just parts of topics, in other topics. Commands you include in a topic can dynamically generate lists, such as showing all topics which link to the current topic. Beyond this, ConnectedText allows you to create properties for topics. For example, you may have a topic for each state in the United States, and these topics could include properties such as "Governor" or "Population." It then becomes possible to easily produce a list of, say, all states with a Population over a million. However, while formal structure is nice, ConnectedText doesn't mandate it. You can also generate lists of topics which include any arbitrary text string, for example. Templates provide a way to get a default structure for a topic, so if you constantly find yourself typing the same properties or categories over and over, it's a good idea to use a template. ConnectedText 5 allows the inclusion of checkboxes, dropdowns, and lists, which make it easier to set properties to specific values. Other features new to ConnectedText 5 include a "cloud" view or command, and a "LikeThis" command, which can find related or similar topics without an explicit link. In terms of flaws, ConnectedText still lacks one very useful feature: The ability to see multiple topics in the same project at once. It also cannot open a project on a network drive, though it can open one in a Dropbox folder, which helps. Editing of tables remains complex. If you don't know CSS, you lose a lot of control over the appearance of your projects. The trial period offers full functionality for thirty days, with the exception that the logo appears in the background and is watermarked on any exports or printouts. In general, if you tried older versions of this program and didn't care for them, it's unlikely this version will win you over. If you use an older version, or haven't tried a program of this sort before, I strongly recommend Connected Text 5. Organize and edit your information with this desktop wiki.